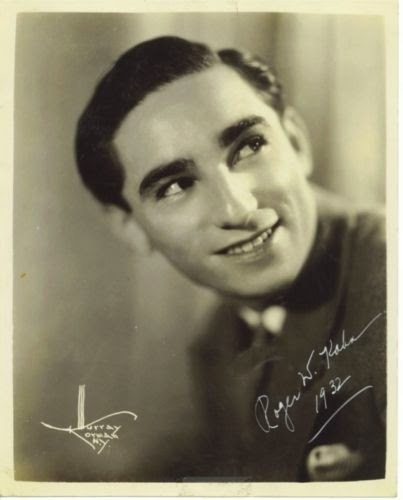 Roger Wolfe Kahn (October 19, 1907 – July 12, 1962) was an American jazz and popular musician, composer, and bandleader ("Roger Wolfe Kahn and His Orchestra"). Roger Wolfe Kahn led a popular US band in the 1920s.His family were multi millionaire bankers, his wealthy background instilled into him a sense of self confidence.At age 16,he bought out a band for himself,retaining the ex-leader as arranger.He then bought himself a nightclub where the band played.His fame spread and his records sold well.Kahn had some brilliant personnel in his band eg,Venuti,Lang,Miff Mole,Vic Berton, etc etc.Yet viewed retrospectively the music rarely rose above ordinary(in my opinion) in spite of the personnelIn 1931 Kahn suddenly lost interest in the music business,disbanded and took up aviation instead.In 1928 RWK wrote one of my favourite songs of the 20s...Crazy Rhythm.Many great versions of this song were recorded,but RWK's own version is decent but pedestrian compared to other bands (listen to Fred Elizalde version).Say Yes Today has a nice medium pace flow to it,with a gorgeous melody.It has a long Venuti solo in the mid part.followed by Miff on trombone. A Walter Donaldson composition,who himself after having endless international hits from 1917,but after 1931 he kept composing but never had a hit again.